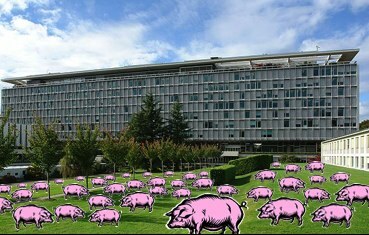 To Dr Margaret Chan, Director-General of WHO and Dr Jacques Diouf, Director-General of the FAO: We call on you to investigate and develop regulations for factory farming in accordance with public health safety standards. Food production must be regulated to ensure global health security. Scientists are looking into initial indications that link the triple hybrid 'swine flu' and factory pig farms that are dirty, dangerous, and inhumane. Let's call on the United Nations World Health Organisation and the Food and Agriculture Organisation to fully investigate and regulate these farms to protect global health. Big agrobusiness will try to obstruct any attempts at reform, so we need a massive outcry that health authorities can't ignore.